The Streamster includes most of the software features of the A-LIST BROADCAST server, but is dedicated to IP operations - with no baseband video input or output. 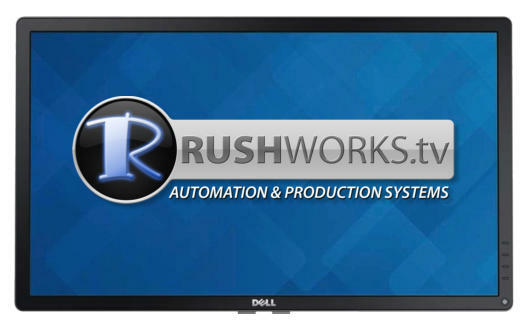 This cost-effective hardware/software combination is the “little engine that CAN” for managing and streaming your own Internet TV station, featuring NDI and streaming input and output. Just 7” x 7” x 1.4”, this is the smallest “Master Control” computer you’ll ever use. Although tiny, it’s a monster when it comes to power and features. It includes the latest generation i7 processor, 16GB of memory, a lightning-fast 512GB SSD (1TB optional), keyboard and mouse, running on Windows 10. With an impressive complement of USB ports and GigE, wireless and Bluetooth capability, it redefines the concept of “Network Broadcasting”. 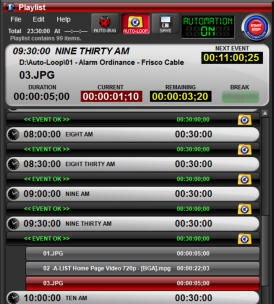 PLAYLIST AUTOMATION uses a simple, graphics-oriented drag-and-drop interface that makes list creation and management intuitive and fun. The unique system design offers unmatched flexibility and simplicity by playing any combination of files and folders … with automatic looping of specified folder content when tight scheduling is not required. Our PLAYLIST TOOLS let you create and manage all aspects of your playlist - from Events to Breaks, to multiple types and layers of Overlays. Display ALL layers over playback or live video without the need for additional hardware. The AUTO-LOOP function assures that you’ll ALWAYS have content being displayed, even if you only need to schedule a few specific Events by time-of-day. True to our K.I.S.S philosophy of Keeping It Simple, all you have to do is copy files and/or folders into the AUTO-LOOP folder on your D: drive, click the AUTO-LOOP folder icon to activate it, click the START AUTO button, and your channel is “on the air”! Since Windows automatically sorts alphanumerically, you can add numbers if you wish at the beginning of your files and folders to determine the playback order. In any case you can choose whether you want to play ALL the items before the loop starts repeating - or have them play in Random Order. Scheduling SLIDESHOW FOLDERS is an easy way to automatically display a collection of pictures with a specific audio track or song playing under them. These folders are restricted to audio files and pictures, and NO video clips.